National Legal Services Authority (NALSA) has organized the National Lok Adalat Today throughout the country in all courts at all levels from the Taluk Courts to High Courts. NALSA informed that the exercise has resulted in a great success due to the efforts put in by the State Legal Services Authorities across the country as well as the High Court Legal Services Committees. As per the NALSA press release more than 3.5 lacs cases as per the figures received till 5.00 PM, which include 1.9 lacs pending and 1.6 lacs pre-litigation cases, have been settled. The total value of the settlement amount reached today is Rs. 1185 crore. The nature of cases which were taken up in the National Lok Adalat today ranged from Criminal Compoundable, Bank Recovery, under Section 138 NI Act, MACT, Family/Matrimonial Disputes, Labour Disputes, Land Acquisition, Electricity & Water disputes and Civil etc. 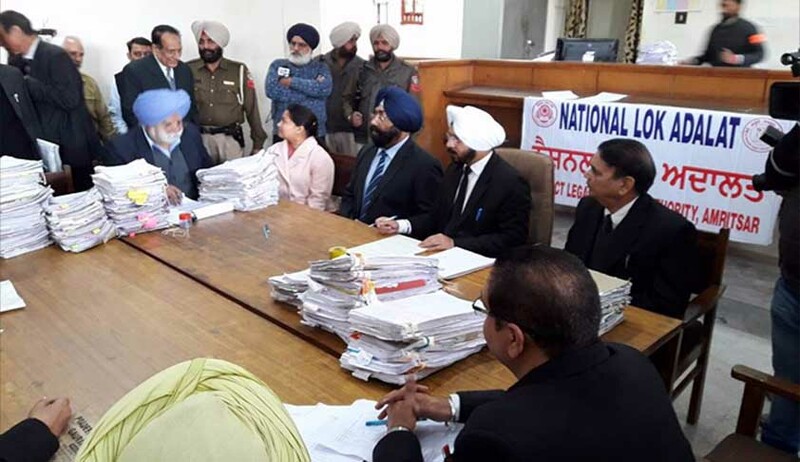 “It is evident that the National Lok Adalat has greatly benefitted the common man and it has been achieved not only because of the Legal Services Authorities/Committees but also because of the cooperation of the State Governments and local administration as well as the financial institutions which include Banks and Insurance Companies. The aim is to reduce pendency as well as prevent additional litigation swathing the courts, where settlements are possible”, states the release. Chief Justice of India Justice JS Khehar is the patron of NALSA and Justice Dipak Misra is its executive Chairman.